Emperor Godaigo started to fight against Kamakura Shogunate to bring back the political power of Japan to the imperial family and Ashikaga clan, originally stood by the Shogunate, helped to defeat the Shogunate. 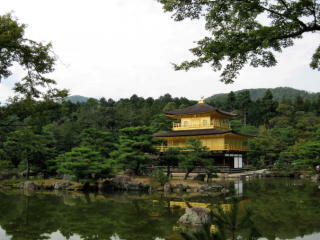 Emperor Godaigo initiated new government in Kyoto, but he created conflicts with Ashikaga clan and was ousted from Kyoto. Ashikaga clan put another stream of the imperial family forward as Emperor; thus there were two Emperors in Japan at that time and laterAshikaga clan unified two imperial streams. In the period, many Zen temples were subdivided tosmaller temples and due to limitation of land and water supply,they produced simple and sophisticated Zen garden, Kare-sansui known as dry Landscape garden. 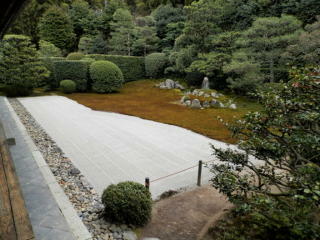 Because the stylelimited color and movement in garden, it was suited to expressZen enlightenment; quiet and harsh. Also, new architecture style, Shoin-zukuri building was emerged and many Zen temples were built by the style. Most of Karesansui were made in the front and back of Shoin-zukuri building. Front yard usually facing south was made to be an openspace for the followers and back yard facing north was to be a private space for Buddhism priests.